Sunrise, sunset, swiftly fly the days. So don't let another day go by without letting someone you know that you are thinking of them. This delightful arrangement will brighten anyone's morning, noon and night. 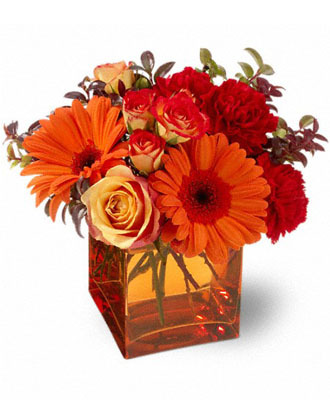 Fiery orange roses, spray roses and gerberas plus red carnations and huckleberry, are arranged in an exclusive orange cube vase. This arrangement is bound to get glowing reviews and thank-yous! Color of vase may vary.